This is great. We’re forging ahead into new territories. I was worried that electric technology was done for, but it seems that there is new hope in the horizon. China is also forging ahead with electric vehicle technologies, and so is Japan. I do foresee collaboration between all these parties. Now that I’ve posted a screenshot of Twitter, you can bet that Twitter arbiters will take notice of this blog. And because my last post mentioning Elon Musk was a reblog of RT, the folks at Twitter will call me a Russian hacker. It sounds unbelievable right? Hear me out. Bandai Namco is a well established name in anime circles. They were pretty big even before the internet era. Elon Musk is a celebrity, his name is always on the front page. RT is a news company, they report the news. So if everybody can just remind Twitter of these facts, that would help alot. When CNN links Elon and Bandai together, it’s called patriotism. If I link RT and Elon together, it’s considered Russian hackering. 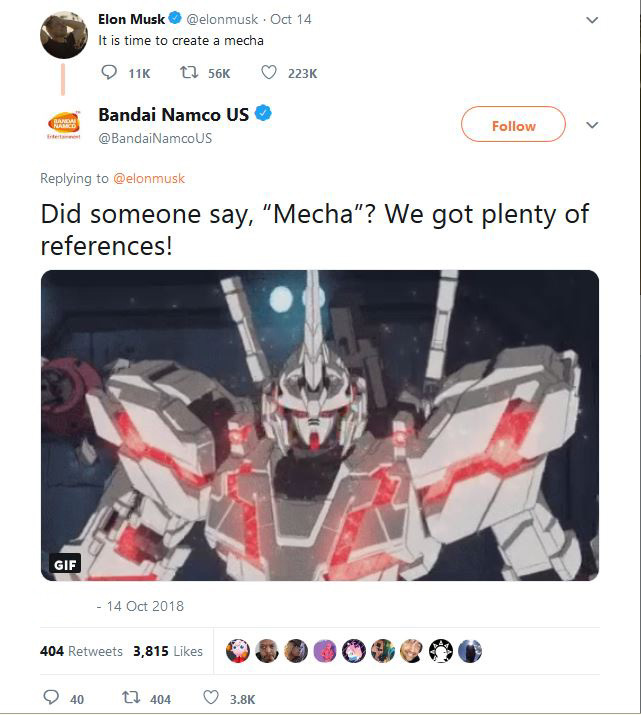 If RT links Bandai and Elon together, it’s considered a breach of national security. That’s the present situation as it stands. We should never be afraid of calling out the mainstream news, because if and when we do, society will plunge into the abyss. This is what happened to Ukraine. Ukrainians no longer have any access to real news. All of their news is Ukrainian Deep State propaganda. They were American account holders too. Independent news sites. Not even remotely connected to Russia. But what they did was they reported viewpoints and opinions that lay outside the mainstream news paradigm. With these 4 organizations, you can kinda picture what they have in mind as far as criterion for Russian Hackerings go. Anything that doesn’t toe the line of what these 4 organizations espouse is immediately deemed to be Russian Hackering. Edward Snowden revealed to us that the CIA had in their capabilities, a tool that could hack into any computer system on the globe. A feature of this tool is the ability to mis-attribute the attack vector so as to make it seem as if someone else did the hackerings. Anytime that we hear of a hackering attempt anywhere in the world, it’s very likely that it was the CIA that did it. WaPo, the NyTimes and the ADL serve as the media megaphones to spread the mis-attribution through social media to cover the CIA’s tracks. Did you know that Edward Snowden is a fan of Anime as well? Yup, anime is pretty big, and I’m delighted to hear that Snowden is a fan of Anime! Assange has had his internet connectivity restored. This is good. Finally we can figure out if Assange is still alive. There had been rumors that he had been killed 2 years ago. If his internet connection has indeed been restored, then we should expect video confirmation of it soon. Let’s just hope that it is video, and not simply text tweets. I want confirmation that he is alive. This is a very big story. It’s not as simple as the UK media makes it out to be. It’s a very big story. It’s not about Skripal that’s for sure. There’s a very big reason why the UK media has been pushing so hard for this story to gain traction, but has failed miserably on both social media and mainstream media. Bellingcat alleges that he has uncovered the identities of the 2 tourists in Salisbury. And you would think this would be BIIIIG NEWS. But it isn’t. And the reason is because the UK mainstream news editors don’t know who poisoned the Skripals. If Boshirov and Petrov were GRU agents as Bellingcat alleges, Bellingcat doesn’t know what they were in Salisbury for. What if, just what if they were there to protect Skripal? What if it was the UK who poisoned Skripal and Russia simply failed to stop it? What if the CIA was there to observe the whole thing? What we do know is that the UK got their stories incredibly mixed up. From the perfume bottle, to the suspects’ names, to Skripal not even dying to “Novichok,” and the UK’s refusal to let Skripal speak to the Russian police. That’s why I think that the UK media has been stumbling so badly in the propagation of the Novichok narrative. They don’t know. That’s why they’ve been compensating for all of this with economic sanctions because they know they don’t have a story. Or worse, they do know that the UK agents did it, but are covering up for them in the most malicious way! This entry was posted on 10/15/2018 by Digital Empire in Asia, EU, NA, Russia and tagged anime, Elon Musk, Julian Assange, Snowden, twitter.